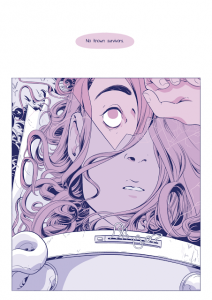 Rosemary Valero-O’Connell is a rising star of comics, and I’ve been following her work with great interest. 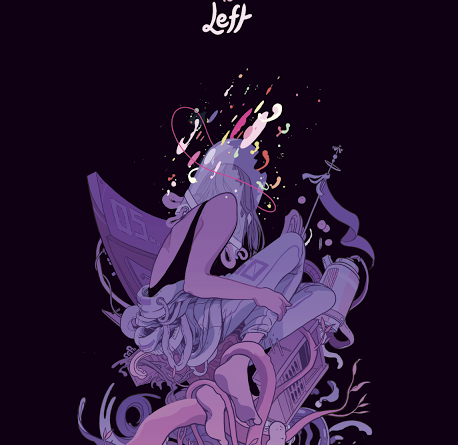 She’s currently working on a graphic novel with Mariko Tamaki, and her early work from Talk Weird Press, If Only Once, If Only for a Little While, captivated me. 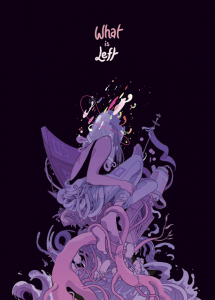 Now she is back with a new mini-comic What is Left, published by Short Box, and it shows how much she’s progressed over the last few years. In What is Left, Valero-O’Connell use a farfetched science fiction premise to explore the intimacy of the human memory. Deep space travel is powered through a feed of brain activity from a sleeping donor – their dreams and memories. But when a malfunction causes the engine to explode, a random crew member gets pulled into the memories of the engine’s donor like a protective cocoon. Once inside, the crewmember experiences the donor’s memories of her life like a patchwork quilt; she is a foreign observer in a delicate, intimate space. The art of What is Left is gorgeous, a combination of Valero-O’Connell’s powerful detailed linework and lovely colors (a mix of navy, purple, and pink, in various intensities). 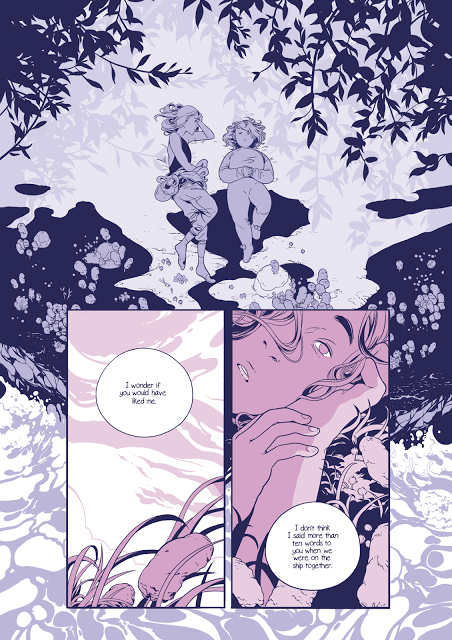 Valero-O’Connell uses this palette, which feels like a late sunset over a lake, to great effect – the limited colors keep the page fresh. The blend of colors allows her to create powerful contrasts and control emotional tenor. 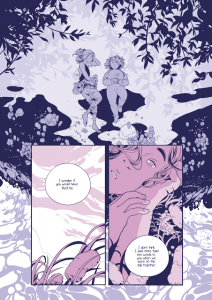 A specific example is where Valero-O’Connell uses alternating colors to show panels moving between the crewmember’s reactions and the donor’s memories. 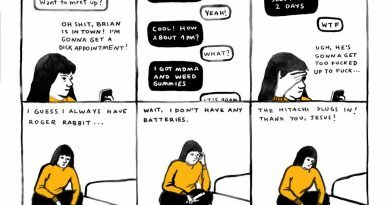 These creative choices make the comic’s beats more intense, and give the work a gravity that is hard to achieve in 36 pages. I am especially impressed with the way What is Left is paced. With a story like this, there’s a potential for things to become maudlin if you let it drag, but Valero-O’Connell keeps the tempo crisp. In a story primarily about memory and loss, Valero-O’Connell doesn’t allow sentimentality to overwhelm the storytelling. No single memory or moment drags on too long, and the ending is heartbreaking, and more importantly, earned. I am captivated by What is Left. Valero-O’Connell asks the reader to consider the complexity of others and to explore the ways we engage with those people. She explores the nature of human desire, the need of people to be seen and loved, the bitterness of regret, and the even more bitter realization that all things must come to an end. In some ways, it even approaches the age-old question, “What happens when we die?” For such a short book, there’s a lot packed in. And thankfully, Valero-O’Connell pulls it off – What is Left is a fascinating read. 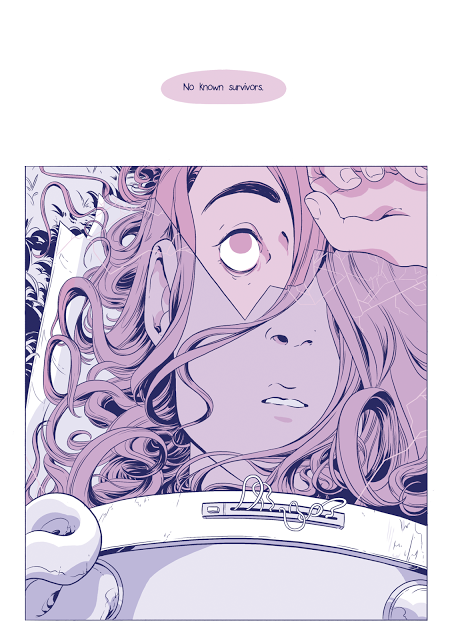 A version of this review was published in Selections #3 in September – you can buy a copy at the webstore, or get one by becoming a patron of Sequential State.